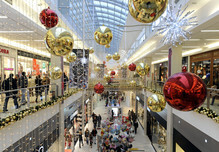 A new survey conducted by Bobatoo.co.uk has found that two-thirds of UK shoppers plan to spend less this Christmas compared to last year. With the Christmas shopping season well and truly upon us, Bobatoo asked over 2,000 people about their spending plans this year. The survey revealed that over half (53%) begin their Christmas shopping in October or November, and the most common number of people to buy presents for is between 5 – 10 (45%). Perhaps the most significant finding of the survey was that two-thirds of UK shoppers are planning to spend less on Christmas this year compared to last year. In terms of where the money goes, 45% spend most of their budget on family members and 38% spend most of it on presents for children. The most common amount to spend on presents per child is between £50-£100 (22%), while for partners and spouses it’s less than £100 (40%). In total most people are planning to spend less than £300 on presents this year (37%), while 13% think they’ll spend more than £700. As well as presents there’s also all the Christmas food and drink to buy. 41% of respondents say they will spend between £100-£200 on all the ‘extras’ like decorations, food and drink. “It is clear from our survey that this Christmas will see UK consumers continue to shop savvy and look for deals and savings wherever they can find them.